Those of you that are frequent visitors to Simply Organized Life's main website (link at right) will have noticed our press release from April 13, 2006. Simply Organized Life is honored to now be a partner with the Washtenaw County Waste Knot Program. The photo above is from yesterday evening's Waste Knot Awards Ceremony. 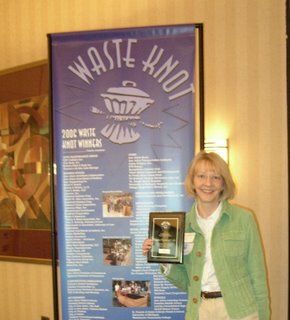 It was a great pleasure to be recognized as the first and only Organizing Consultant to be a Waste Knot Award Partner. Eliminating waste and caring for our environment is important to me in how I run my business and how I work with my clients. I am so happy to be recognized publicly by my fellow Waste Knot Partners, businesses both small and large. To learn more about the Waste Knot Program click on the link at: www.simplyorganizedlife.com/aboutus.html.